At CES 2016, Lenovo has updated their gaming laptop line-up with two new mid-range options that use the latest CPUs and GPUs from Intel and Nvidia. 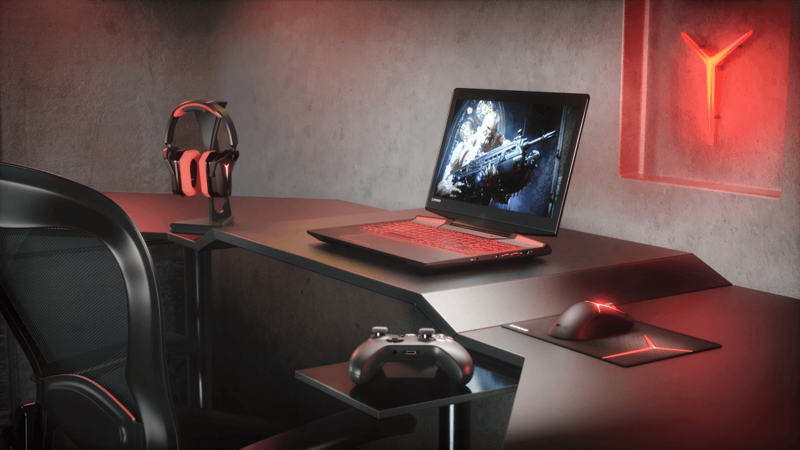 Rather than simply slotting these products into their existing Y series of laptops, Lenovo has given them an entirely new brand: Legion. The Legion Y520 is the smaller and cheaper of the two products on show at CES. It packs a 15.6-inch 1080p LCD in a respectable body, clocking in at 2.4 kg heavy and 26mm thick. Lenovo says this laptop is packed with an Intel Kaby Lake processor, although they didn't specify which one, and "up to" a new Nvidia GeForce GTX 1050 Ti discrete graphics chip. Like other mobile GeForce 10 series products, the GTX 1050 Ti is essentially the same as its desktop counterpart, and should provide performance similar to the GTX 970M. Lenovo will let you kit the Y520 out with up to 16 GB of DDR4 RAM and up to 512 GB of PCIe SSD storage, although base models will pack either a 128 GB SSD or even a 500 GB hard drive. This laptop also comes with a USB 3.1 Type-C port (not Thunderbolt 3), Ethernet, and HDMI along with a Wi-Fi ac chip. The keyboard comes with optional red backlighting and a travel distance of 1.7mm. You'll be able to purchase a Y520 in February with prices starting at $899.99, which is a few hundred dollars cheaper than existing 15.6-inch laptops with the more powerful GTX 1060 inside. Those who crave more performance may be interested in the larger Y720, a 17.3-inch system with both 1080p and 4K display options. Lenovo has kitted out this laptop with an Intel Core i7-7700HQ or Core i5-7300HQ processor, along with an Nvidia GeForce GTX 1060 with 6GB of GDDR5 memory. Like with the Y520, this laptop comes with up to 16 GB of RAM and up to 512 GB of PCIe SSD storage. The Y720 has some features not included in the Y520, such as a Thunderbolt 3 port and RGB LED backlighting for the keyboard. It also supports Dolby Atmos audio through three speakers that, somehow, produce "sound from every angle". One configuration option sees an Xbox One wireless controller dongle integrated into the Legion Y720. Lenovo says the Y720 will be available in April starting at $1,399.99.